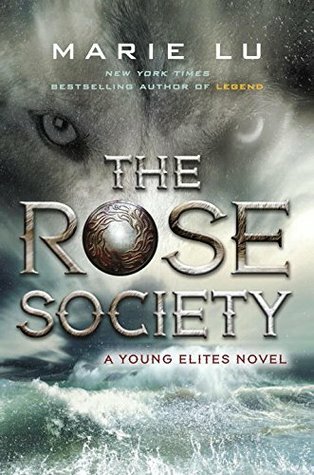 The Rose Society by Marie Lu and is narrated by Carla Corvo and Lannon Killea is the second book of the Young Elites books. 1. This book starts several weeks after the end of the first book. The Daggers have forced Adelina out, and both Adelina and the Daggers have fled Kenettra and are plotting revenge. In Kenetrra, Teren has put into place a plan to rid them of the malfettos. There are a lot of elements in play in this book which gives a little bit of slow start to bring everything together. 2. I found myself not liking Adelina in this book. I get her paranoia and bitterness after the way the Daggers treated her, but that she takes most of that out on her sister bothers me. She is also losing control of her illusions and refuse to admit she needs help. I really disliked her at the end. 3. This book introduces Magiano, Sergio, and Maeve. I really liked Magiano. He was a lighter side to a darker book. It is moments with him that I like Adelina the best. Plus, I think there is way more chemistry between him and Adelina than there ever was between Adelina and Enzo. Then Sergio, who we find out, is the elite that Raffaele referenced when warning Adelina about what happens when you cannot control your powers. He is a lethal mercenary and can control the storms. Plus, I like what is happening between him and Violetta. Then there is Maeve, the queen of Beldain, and can raise the dead. With her, we get to see how other countries see their elites as gifts from the gods, and not abominations. 4. The bomb Lu drops at the end with the discovery of what the powers are doing to elites was a shocker. I am excited to see how the story is going to play out with this revelation and where the story goes in the third book.